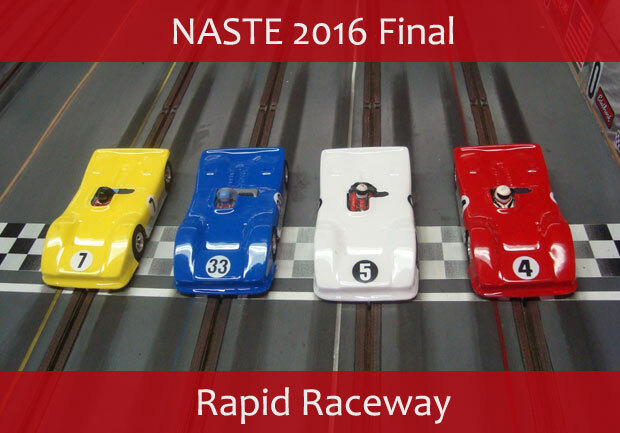 The NASTE 2016 racing season was brought to a close with the final race held at Rapid Raceway. There were two preliminary races followed by the final Shoot Out race for the championship. A set of four 1/24 Sports Racer cars were used for the Trophy Dash race and the "B" Main. The cars featured Ferrari 312P bodies supplied by Team Bluegroove of Canada, mounted on H&R chassis running H&R 26,000 RPM motors. The cars proved to be very durable and provided for some very close racing. The first race was the Trophy Dash for all the NASTE racers who did not compete in the Point Series Championship. Dorothy "The Hammer" Abbott lead the way to the finish line to take the win. The "B" Main was made up of the Point Series competitors that were below the top three in points, with a few other experts thrown in for good measure. It was Gary "Howie" Howard that showed the field how to drive the Sports Racers. Runner up Terry Abbott was the highest finishing racer in the point chase and he moved up to the main event, the race for the championship. For the main event the racers competed with the traditional NASTE '55 Chevys. 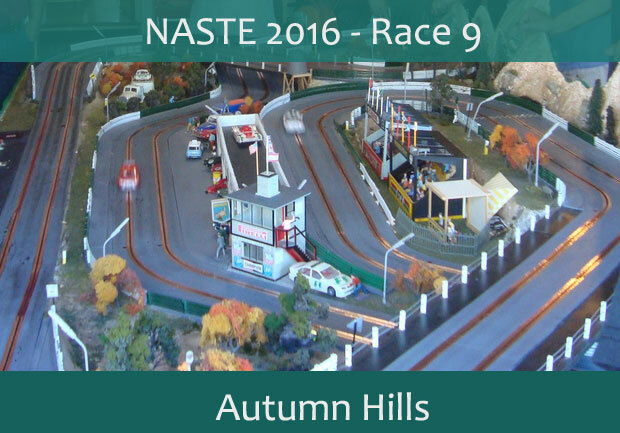 These cars have been raced throughout NASTE's 20-year history and always prove to be challenging! And taking top honors in the Main Event was Battlin’ Bill Bostic. So we have closed out another season. Next season the NASTE Point Series Championship will be moving to the NASTE Odd Thursday Night Racing venue. Stay tuned for more details! 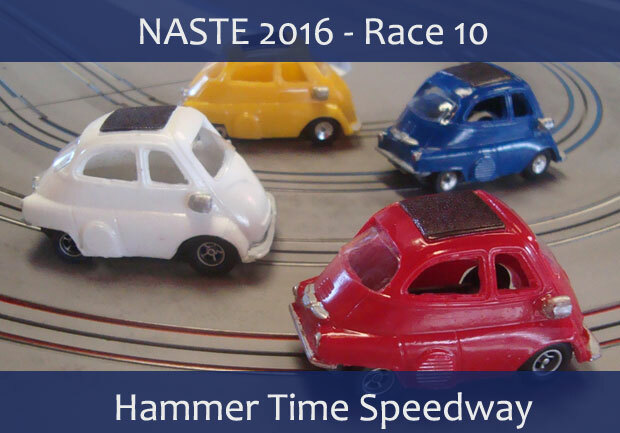 An excellent field of twenty racers met at Terry and Dorothy Abbott's Hammer Time Speedway for the final round of the NASTE 2016 Championship. The Hammer Time Speedway is a four lane Max Track for HO scale cars. Terry had prepared three sets of cars for us to race in the NASTE IROC style race format. Our first and actually most challenging task was to complete a set of two-minute heat races with a group on Thunderjet Pontiac GTOs. They ranged from mild to wild. After all the racers struggled through the GTO races, Terry brought out the Isetta’s to race. Small, a little tippy, challenging. Did we mention small? This was the second appearance for the Isetta’s and they are quickly becoming a crowd favorite despite the driving challenge. After the dust from the last Isetta had settled out came the dirt track style Willys. These cars are the best handling and fastest of the cars Terry prepared. And all the racers stepped up their game turning in quicker lap times with the Willys. When it was all said and done Terry and Richard Phillis (of The Fray in Ferndale fame) tied for first place in the Expert Division followed by Bill Bostic and Bryan Trachsel. In the Novice Division Dana Denton took the win with Al Christensen second and Dorothy Abbott – The Hammer – third. It was a great race and we would like to thank Dorothy for all the delicious food as well as Terry for the fun track and cars to race! On April 17 the racers met up at Rico Locati's Autumn Hills Raceway in Milwaukie for the ninth race of the 2016 season. Round one of the race had Fly Porsche GT1's on the starting grid. Although the cars performed quite well they proved to be a handful on the challenging course. Both the Novice and Expert divisions struggled somewhat with the cars, but still turned in some impressive lap totals. After the racers had put the Fly Porsche's through their paces they were removed from the track. And then..........there they were on the start line. Yes, it was the return of the Flying Fickle Fiats of Fate! A pair of Ninco's finest.......ok maybe not quite their finest, but it was a pair! There is no way these cars should be this much fun, but on the Autumn Hills track the Fiats RULE! Both Novice and Expert racers thrashed the little Ninco Fiats with the finesse seen only in destruction derby’s! But the Fiats love to be thrashed and in return reward the driver with lap totals beyond belief! The excitement provided by these cars on the twisty tight Autumn Hills course is the reason for their popularity. When it was all said and done Dominic Locati recorded his first win in the Novice Division followed by June Petrequin in second and Victoria Saager in third. Rico Locati recorded the win in the Expert Division with AJ Locati taking second and Bill Bostic placing third. When the IROC racing was finished, racers brought out their NAK-Spec Scalextric Trans Am cars to compete in the final NASTE Trans Am Cup race of the season. Monte Saager scored the win, with Bill “borrowed car” Bostic placing second, and Jeff Fields third. This concludes the season for the NASTE Trans Am Cup. Next year we will be looking at another class to replace the magnetic traction cars which were somewhat of a disappointment to race. A race at the Hills is seldom without a fantastic spread of food and once again Kelly put together a wonderful feast for the racers. 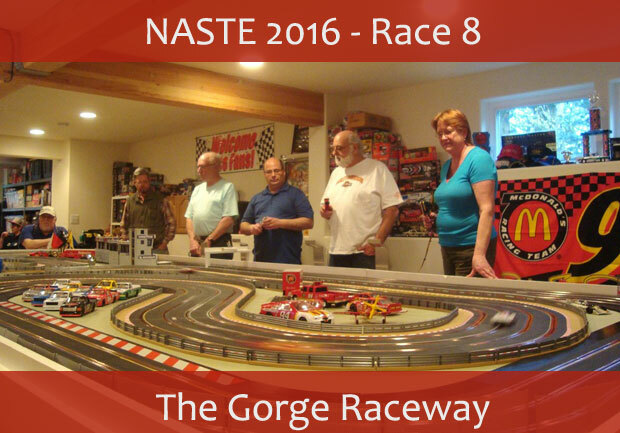 On March 29th the NASTE racers made the trek to Troutdale, the home of Bob Nakamura’s large Scalextric 4-lane layout better known as the Gorge Raceway. We had been scheduled here earlier in the season but a small flood took over part of Bob’s basement hastening the reschedule. And what a treat. In the interim Bob had not only repaired the water damage to his basement but also found time to cover the lane rails in copper tape. Beautiful, shiny, copper tape! Conductivity issues were now and thing of the past as cars zipped around the track with reckless abandon with an accent on the reckless portion. And don’t forget there were still corners in the way. After some time for practice and food the cars of the evening were presented – Slot.it Porsches sharply tuned by Bill Bostic. They were quick, handled great and brought a great fun factor to the night. First up, the Novice bracket with Thomas Flood added to the mix to fill out the four lane grid. And in true expert fashion Thomas took them to task, with Victoria Saager taking second and Daryl Deabler taking third. In the expert Division it was home track favorite Bob Nakamura besting the field with a strong pair of runs taking top honors in each. Bill Bostic raced to a hard-charging second place finish with Monte Saager taking third. In the end it was another wonderful afternoon of food and fun at the Gorge Raceway. Thanks to Bob for hosting. We look forward to our next encounter. 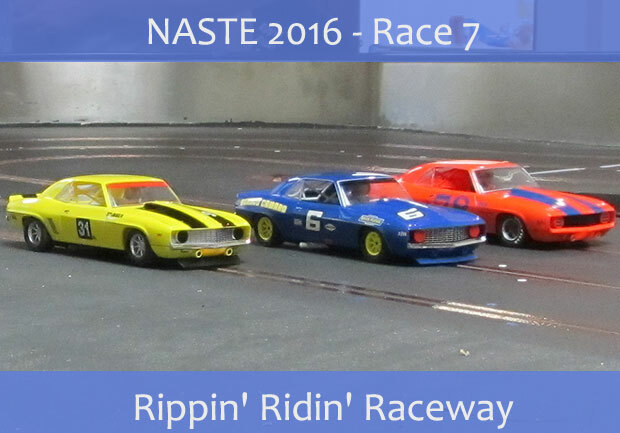 On February 21st 2016 the NASTE gang descended (literally) on Al Christensen's basement for the seventh race of the 2016 NASTE season and to officially break in Rippin' Ridin' Raceway. RRR is a fast three lane routed track with a couple nice long straights, some twisty esses, and a tight hairpin thrown in for good measure. Al had two different sets of IROC cars prepared for the race. The first set of cars were Slot.it GT40s. The GT40s were well prepared and provided for some very close racing. In the Novice group Dorothy Abbott finished first with Dominic Locati second and Perry Petrequin finishing in third. After the Novice group the Intermediates took the track. Finish positions were again close with Todd Flood in first, followed by Jimmy Jones and Tyler Petrequin. The last group to hit the track with the GT40s were the Experts. Bill Bostic finished first, Monte Saager second, followed by Bryan Trachsel in third. After the GT40 race Al put a set of Parma Womps on the start line. These cars proved to be much more challenging! The cars were fast, a little loose, and most of all WIDE! Nerfs were not uncommon! First up were the Experts and Bryan Trachsel led the way followed closely by Bill Bostic in second, and Rico Locati in third. After the Experts had thrashed on each other the Intermediates took the track. Tyler Petrequin was able to best the field taking first, with Todd Flood second, and Jimmy Jones posting a third place finish. The Novices then took over and showed us all how to efficiently run the Womps! This group seemed to have the least amount of trouble with the evil handling little demons! Dorothy Abbott finished first followed by Perry Petrequin and Victoria Saager. After both IROC races were completed the NASTE Trans Am Cup race was held. This race is for racers who have NAK-Spec Trans Am cars. The NAK-Spec Trans Am cars ran very well at Rippin' Ridin' Raceway. Traction magnet position was an important factor in good handling characteristics. After the dust had cleared Al Christensen was first, Bill Bostic was second, and Monte Saager finished third. It was a great day of racing and Al's track was a joy to race on! Everyone had an excellent time, the food and snacks were awesome, and the track is officially broken in. This past Sunday another legendary demolition derby thinly disguised as a three hour Enduro made it's impact felt at the Jacquelin Park house of pain. It was wild. It was cray. It got downright confusing. It got crazy to the point a normally passive racer or some renown was induced to final heat Cobra hunting - though after a few laps he remembered who's cars they were and the onslaught softened. After many offs, collisions and shredded tires no results were able to be understood and all left if not happy, at least somewhat content. To paraphrase Rasheed Wallace "All teams played hard". Friends, food, fun, and a little racing! Well OK, maybe more than a little racing. With 22 racers in attendance there was quite a bit of racing! Novice, Intermediate, and Expert racers put more than 2 hours of run time on the V Womp and Slot.it Porsche 962 IROC cars. Both classes of cars handled the pressure well, with only two minor malfunctions with the Slot.it cars. Hundreds of laps were put on each set of cars, and for the V Womps, well this was their third go around. The V Womps have now survived three IROC NASTE races without any major problems. For this race we again divided the starting grids by driver skill, as they chose which division they wished to race in, starting again with the Novice Division. The Novice races were exciting. The youngest racer Dominic Locati, showed he could run upfront with the best! Todd Flood was very fast and ran up front all night! After both rounds of racing Dorothy Abbott finished in first place, followed by Todd Flood in second and Victoria Saager in third place. The Intermediate Division was just as closely contested with some serious battles between family members Perry and Tyler Petrequin. Through it all Al Christensen quietly motored on to the checkered flag and the win. Perry Petrequin finished second, with son Tyler taking third. When the Expert Division took the track, the real IROC test session started. The entire field was fast, and the racing included some excellently executed nerfs, as well as some dramatic crashes! In the end it was Battlin’ Bill Bostic first, with Flyin’ BryanTrachsel in second, and Goose Gossett finishing third. With all the racers in attendance the IROC portion of the NASTE Race ran pretty long. It was decided since there had already been a NASTE Trans Am Cup race run at TooBad Motorplex we would cancel the official Trans Am Cup race for the night. However, some of the diehards stuck around and ran an un-official Trans Am race. Gary Goose Gossett showed he had the car to beat in this race. His Camaro was fast and stuck like glue winning the race by a full lap. After the race the bench racing began covering all kinds of topics. Most notably how we all felt we are really lucky to have such a great group of people to race with. While many racing groups struggle to fill the field and still have enough turn marshals, we routinely have enough participants to enable folks to chat, play board games, and much on goodies. We were especially proud to have Russell Flood in attendance for this race. Russell has chosen to serve his country by enlisting in the U.S. Army. He has just completed boot camp and was home for the holidays. It was great to see him and we are all thankful for his commitment and service! With all that happens at our races, and all the fun, it is evident NASTE really is a special group! 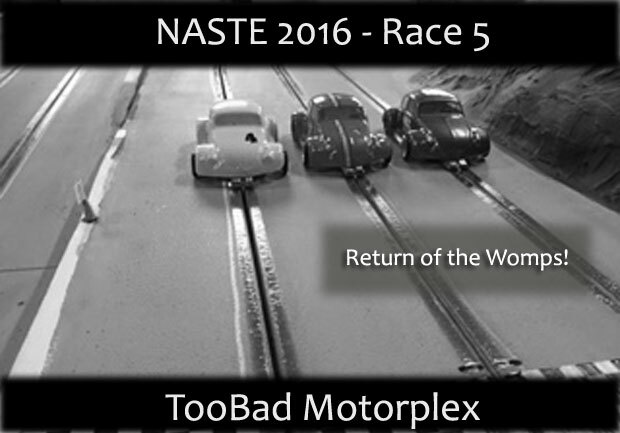 Race number four of the 2016 NASTE Season was held at TooBad Motorplex in Fairview. 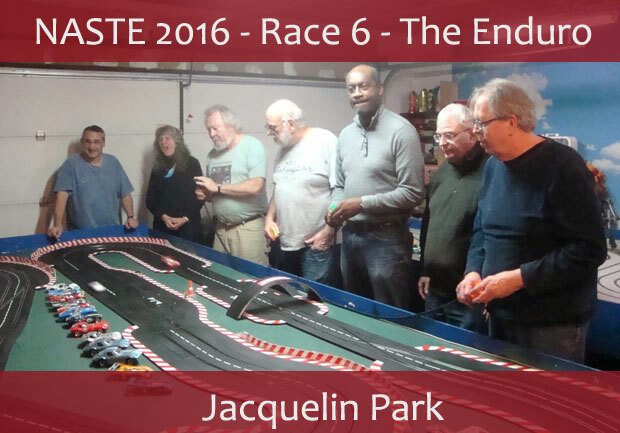 We had eighteen racers in attendance, pretty equally divided between Novice, Amateur, and Expert Divisions. The race format for this race mirrored the previous races this season, with the novice, amateur, and expert racers placed on starting grids together. Two rounds of racing, each with three minute heats were completed for each division of racers, with the novice racers starting first, followed by the amateurs, and then the experts. This seems to provide for some very close racing, and little if any negative feedback. For each division's first round of racing the VWomps returned to TooBad Motorplex. The cars were unchanged from last years’ event, and like last year the cars performed well. That's not to say they weren't a handful, but everyone seemed to manage. And the cars all survived another year's racing! Each division's second round saw the Monogram Grand Sport Corvettes on the starting grid. Sighs of anxiety were heard throughout the crowd. But hey, something was different from last year's race. The Vette's were fitted with urethane tires that had been trued. Holly slippery snot Batman! Someone had done some tuning on the crappy Vettes of last year! Of course that's not to say they were now excellent cars, but hey, they were somewhat better than last year. At the end of the NASTE IROC race Todd Flood had won the Novice Division, older brother Thomas Flood took the Amateur Division win, and Bryan Trachsel placed first in the Expert Division. And yet again it was the racers that could deal with adversity the best that finished the best! After the NASTE IROC races were completed the second race for the NASTE Nak-Spec Trans Am cars was held. These cars turned out to be quite challenging on the TooBad circuit. Tires and placement of the traction magnet are the key to success in this class. After one round of three minute heats Blazing Bill Bostic finished first, Goose Gossett second, and Rico Locati placed third. The next round for the Nak-Spec Trans Am series will be at The Gorge Raceway, where the class was conceived. That will be an interesting race! 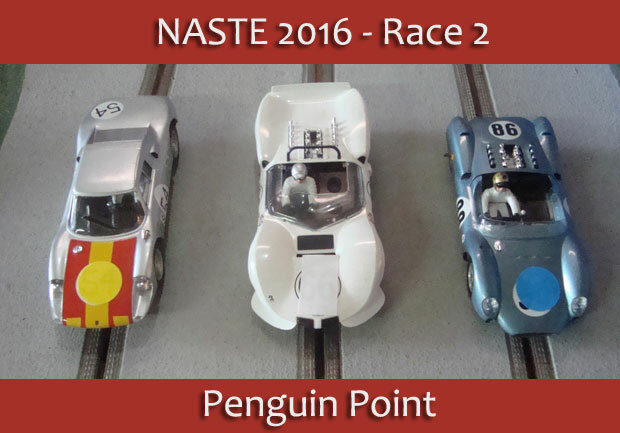 The second race of the NASTE 2016 season was held at Monte & Victoria's Penguin Point in Hillsboro. Monte had prepared two classes of cars for us to race in the usual NASTE IROC format, some very quick and twitchy Revell sports cars, and a set of three fast Slot.it Can Am style cars. 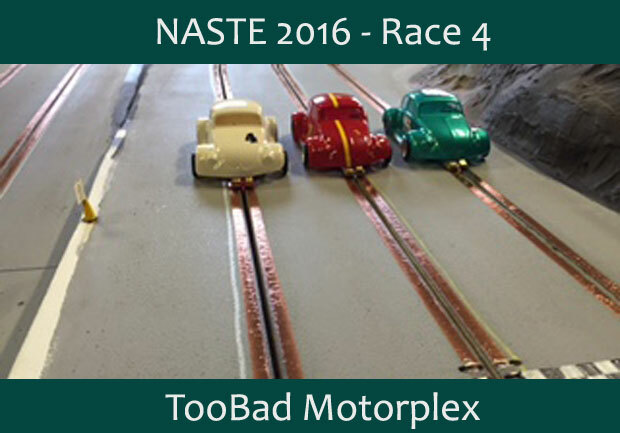 In the new NASTE racing format the Novices were first on the track. The sports cars proved to be quite challenging even at 9.5 volts. The Slot.it cars were the obvious fun favorite. After the Novice Division completed their races the Experts took the track. The reactions to the cars were the same, sports cars very challenging, Slot.it's very quick. At the end of it all the results for the Novice's showed Victoria Saager as the overall winner, followed by Dorothy Abbott in second and Todd Flood in third. For the Expert Division Monte Saager took the win, with Bill Bostic just two tenths of a lap back in second with Bryan Trachsel finishing third. After the NASTE IROC racing the first race of the NASTE Trans Am Cup was held. Rumors of superior handling characteristics had many racers moving their car's traction magnet to the rear most mounting position. Well for Penguin Point this did not prove to be the hot setup! During practice some racers got smart and repositioned their traction magnet forward, some of us were not so smart! In any event the race was exciting to say the least! There were some totally spectacular get offs resulting in high speed front straight head on crashes! Parts were lost as well as positions! In the end, surviving the mayhem was Rico Locati in first followed by Monte Saager in second, just ahead of AJ Locati in third. Some of us just survived! Thanks to Monte & Victoria for hosting another spectacular event and feeding us all! And thank you to all the racers who brought along food and snacks! 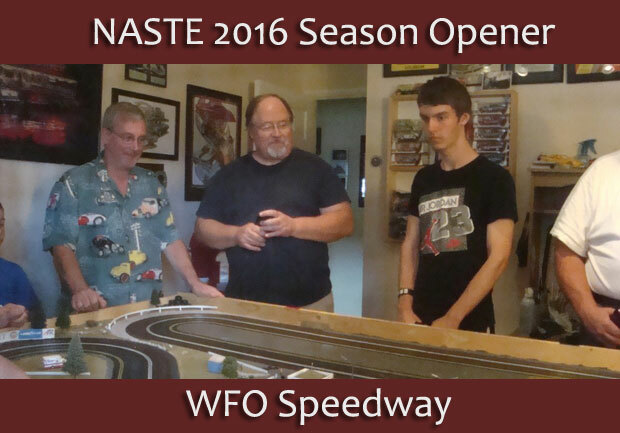 On Sunday September 20th, the NASTE racers converged on Bryan and Sherry Trachsel’s WFO Speedway to do battle in the first round of the NASTE 2016 racing season. In this the 20th consecutive year of the NASTE Point Series Championship, only those racers that choose to be included in the points chase will race for the opportunity to have their name added to the coveted NASTE Point Series trophy. It seems fitting that we start out the season with the smallest cars we race, and work our way up from there. The HO cars at WFO Speedway are always challenging and provide for some very close racing. This first race did not disappointment as Bryan had prepared eight T-Jet style cars to compete with in an IROC style format. Four Model Motoring ’55 Chevys and four Johnny Lightning style AC Cobras made up the field. Another change for this year is the order in which the divisions race. Each division races both rounds of their race consecutively, with each round consisting of one heat race on each lane of the track. The first racers to hit the track were those signed up for the Novice Division. Victoria Saager ran an impressive 208.3 laps to finish first. Next up was the intermediate Division where the race intensity stepped up a notch. When the dust cleared Jeff Fields had emerged as the winner posting 231.2 laps. Finally the Expert Division took the track. After some very close racing Bryan Trachsel showed us all the fast way to the finish line completing a total of 241.5 laps to just slip past a spirited challenge from Bill Bostic by a mere .3 laps. Thank you to Bryan and Sherry Trachsel for yet another outstanding day of racing. In addition to the exciting racing they provided us with a fantastic spread of food. And thanks to all of the racers that brought along additional food and snacks. All in all it was a very fun day!